Jenka's Nightmare, a prominent Cave Story mod by Mark "Shmitz" Major was updated a few months back, marking the first release since the original one about a year ago. According to the author, this new version contains about 75 to 85% of the mod's full content. The mod follows on from the "Sacred Grounds" ending from the original game. A short time after leaving the island, Quote is teleported back by a distraught Jenka to a familar looking cave - however, it seems to have gotten a lot bigger since he was last there. Jenka's Nightmare is a good deal harder than Cave Story - but it's not the frustrating kind of hard - it's the good kind of hard. The kinda hard where everytime you die, you just want to retry and take one more shot at whatever killed you. 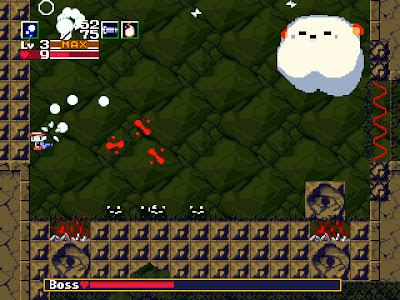 But don't worry - if you managed to take Ballos out in the original Cave Story, it "shouldn't be anything you can't handle", as Kanpachi puts it! 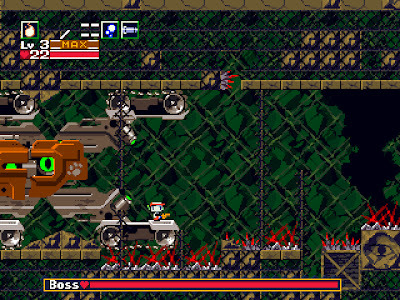 Of all the Cave Story mods I've played, Jenka's Nightmare is easily my favourite. It's clever and inventive, it gets the character's personalities right, and best of all, it's fun. And right now, it's the closest thing out there to a Cave Story sequel. Highly recommended to anyone who likes challenging platformers - or to anyone who just misses Cave Story.